Figure 4-13.Polarity markings and directions of voltages when polarity is subtractive. Home > Construction Training Manuals > Construction Electrician Intermediate > Figure 4-13.Polarity Markings And Directions Of Voltages When Polarity Is Subtractive. It is apparent that when the voltage indicated on the voltmeter is greater than the impressed voltage. it must be the sum of the primary and the secondary voltages: and the direction of the two windings must be opposite. as shown in figure 4-12. Likewise, when the voltage read on the voltmeter is less than the impressed voltage, the voltage must be the difference of the primary and secondary voltages, as shown in figure 4-13. When the terminal markings are arranged in the same numerical order, H1H2 and X1X2 or H2H1 and X2X1. on each side of the transformer, the polarity of each winding is the same (subtractive). 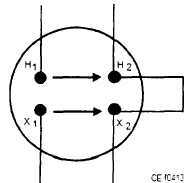 If either is in reverse order, H2H1 and X1X2 or H1H2 and X2X1. their polarities are opposite (additive). The nameplate of a transformer should always indicate the polarity of the transformer. Additive polarity is standard for all single-phase distribution transformers 200 kVA and below having high-voltage ratings of 9.000 volts and below. Subtractive polarity is standard for all single-phase distribution transformers above 200 kVA irrespective of the voltage rating. Subtractive polarity is standard for all single-phase transformers 200 kVA and below having high-voltage ratings above 9.000 volts. Figure 4-12. - Polarity markings and directions of voltages when polarity is additive. Figure 4-13. 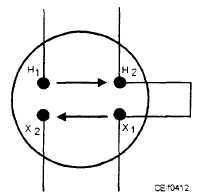 - Polarity markings and directions of voltages when polarity is subtractive. Standard low-voltage terminal designations are shown in figure 4-14. When you are making such tests. voltage must not be applied across the secondary side of the transformer because the primary voltage would then be equal to the applied secondary voltage multiplied by the transformer turns ratio. This voltage would be dangerously high to personnel and would damage the voltmeter. Some important transformer installation rules are listed below. Figure 4-14. - Standard connections for low-voltage distribution transformers.